Size: 5.2" x 4.3" x 0.95"
This TI-7350SV - successor of the TI-7350 - looks at first glance 100% identical with the TI-1795SV introduced in 2000. The only interesting part we found so far, is the backside of the package. The specifications are given in 4 laguages: English, French, Spanish, and Portugese. Rather atypical for Texas Instruments. Dismantling this TI-7350SV manufactured in 2002 by Nam Tai Electronics in China reveals a very clean design without any surprises. 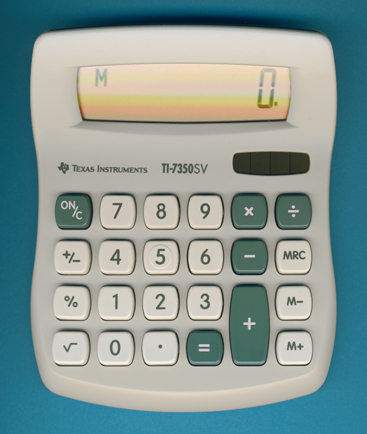 The small printed on the printed circuit board (PCB) finally proofs our suspicion: The TI-7350SV calculator makes use of the TI-1795SV printed circuit board.